Study Supporting Teaching and Learning at University Centre West Kent - Which? You will be taught by highly qualified and experienced staff who have worked in a variety of educational settings and have different areas of expertise such as early years, additional needs, curriculum and social pedagogy. Each module you study will be related to your own setting and experience and there is choice in the second year to select your own individual study. You will study in pleasant classroom spaces dedicated to higher education students and in close proximity to the useful resources of the College’s Learning Resource Centre (LRC). The skills you gain will enhance your opportunities of employment or promotion in the field of education – as you will learn to read critically, write to academic standards, engage in academic research and present ideas and findings to your peers. You will also study and work with your peers collaboratively. Teaching resources will be based around the interactive whiteboard, Moodle, and the reading matter available in the LRC and remotely accessed resources from the University of Greenwich. 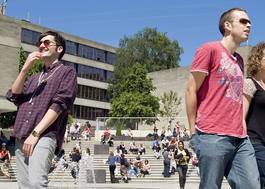 The College’s campus in Tonbridge is modern and conveniently located next to public transport links. This programme has been designed for individuals who wish to work, or who are already employed, in the ‘paraprofessional’ areas in support of the learning and teaching of learners of all ages. This includes roles in the classroom such as learning support assistant, teaching assistant or related roles such as learning mentor. The qualification is awarded and quality assured by the University of Greenwich. The programme is a balance of theory and practical application and it provides a potential route to the final year/stage of a related BA (Honours) Degree, such as in Education Studies or Childhood Studies. Thereafter, graduates may be able to progress to teacher training leading to qualified teacher status. The programme will provide you with an introduction to the field of education studies through the presentation and discussion of general and current education topics and challenging subjects, foregrounding equity and diversity of opportunity and anti-discriminatory practice. It will provide you with a broad overview of the education service and the particular features of the sector in which you currently work, or in which you may wish to work. It will provide contexts in which you will develop and apply critical reflection and self-awareness in relation to your own practice and the relationships with your peers. You will have the opportunity to enhance your personal and academic development, and you will develop the ability to work effectively by expanding your awareness, understanding and evaluation of core learning and self-management skills. Assessment is continuous, based on work-related assignments; there are no exams or timed assessments. With the exception of one unit in the first year (“Active Education: Personal & Academic Development”), all of the assessed assignments are directly related to pedagogy and therefore the programme has a high relevance to professional practice. You will develop academic skills such as writing for a range of different formal purposes, ranging from reflective accounts, essays, reports, research reports, research proposals and observation reports, through to individual and group presentations, team working, public speaking and project work. Subject to acceptance by the teaching university/college, you will be able to progress to the final stage/year of a related Degree programme, such as the BA (Hons) in Education Studies or the BA (Hons) in Childhood Studies at the University of Greenwich. Thereafter, you may be able to access the many options that exist to become teacher qualified in the primary or secondary sectors, such as PGCE, QTS, RTP and GTP. Other career options include family liaison, education management and social pedagogy. The programme consists of four modules per year, each with a weighting of 30 credits. Year 1: The World of Education: Policy, Provision and Practice; The Learner & Education; Supporting the Curriculum; Professional Practice Portfolio. Year 2: Social Pedagogy; Supporting Learners with Additional Educational Needs; Understanding the Psychological, Social and Emotional Aspects of Behaviour; Negotiated Professional Investigation. Please refer to the College website for full details about each module.